Lynn Chamberlain gives a recap of the St. George Winter Bird Festival. A couple of weekends ago, I had the chance to attend the St. George Winter Bird Festival. It was a great opportunity to meet with hundreds of people from all over the State who, like me, enjoy spending time watching birds. Roadrunners are among the birds spotted at the Winter Bird Festival. St. George is a unique part of the state. 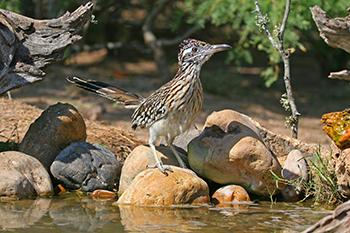 The geography of the extreme southwest corner of Utah attracts birds from three different geological provinces in the winter. The Great Basin to the north, the Colorado Plateau on the east and the Mojave Desert to the south. Each province makes its own singular, contribution to the flora and fauna of the area. It was great to see so many people participating in the field trips in search of the feathered treasures that winter brings to Washington County. Anticipation was high as we sallied forth to find greater roadrunners, vermillion flycatchers or maybe even a white-tailed kite. 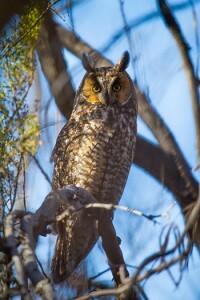 Lynn captured this shot of a long-eared owl at this year's Winter Bird Festival in St. George. My favorite part of the festival was the trip that went to the extreme southwest corner of the state to a place called Lytle Ranch. I was with a group of bird photographers and we were richly rewarded for our efforts. We found and photographed a pair of long-eared owls. These medium-sized owls hunt all night and then sun themselves in the thick brush in the early morning hours. The challenge is to find them in the brush and then maneuver yourself so that you can get a relatively clear view for a photo. As you can see, my efforts were pretty successful. Each year, Red Cliffs Audubon and the Division of Wildlife Resources team up to put on the St. George Winter Bird Festival. It’s a great event that encourages Utahns to get out and enjoy our wildlife resource. If you have never been, I would encourage you to make it a destination next winter. In 2014, the festival will be held January 23, 24 and 25. You can check their website for details as the event gets closer.